We have a good share in the machinery market which is the result of our hard work and best potentials that we apply in the completion of task. With an extensive knowledge of domain we have become the premier choice of our customers that perfectly complete all the order on time. Owning to an advanced manufacturing unit that is situated in the best locality of Noida, Uttar Pradesh, India, we are able to process excellent range of product that completely adhere to latest market & industrial norms. In the successful completion of given orders for our product range, our quality team follow rigorous quality testing methods so that we get the most perfect range of machinery enabled with the high functionality & features. Mr. Yash Chopra (CEO) is the man behind our success that is working from over many years in the sphere of manufacturing & supplying of packaging machinery. With his immense domain expertise he has impressed us and also we have significantly maximized our client base from all over the nation. Today, we are standing at the apex of success behind this is our team that perform in a better manner & deliver the mass array of products in specified time limit. Additionally, in our team we have highly educated & experienced engineers & technicians of industry that know very well how to deliver top quality products that sustain best performance as well as features. Besides this, we have sales & marketing team, quality team, and administrative staff that work round the clock in order for the fulfillment of firm’s objectives. Innovative flexible packaging has become a valuable marketing tool. An attractive packaging helps in impressive introduction of a new product. An optimum packaging, showcases the maturity of the product. Besides the marketing importance, packaging also helps in keeping the constituents fresh for longer time. Besides, packagings of jars and containers become the value added service for the final consumer. We persistently aim at simplifying the process of business communication and dealings. This web interface has been constructed to receive your feedbacks hassle-free. In order to know more about our products and us, please feel free to send the duly filled query form and our responsive customer care team will revert back to you at the earliest. Being as a leading manufacturer, exporter and supplier of packaging machines we have maintained best infrastructural facility that has all the required machinery & tools available at the base. Apart from this, our base is divided into multiple sections including production base, quality control unit, warehouse wing, server room, and administrative block. All the facilities are maintained by us seamlessly at our production unit so that only high quality products are delivered from our end on timely basis. Our products are trusted by many distinguished manufacturers, to assist in their packaging requirements. Our client base is spread all over the world. We inhabit a respected position in the global market. Owing to our customer oriented policies, we continually attract repeat business. Over the years we have earned an unwavering trust from our clients. To achieve customer satisfaction we provide customized services, like shipment, technical assistance during installation and also suggestive measures to help them choose the appropriate machinery. We accept the continual challenge to provide innovative solutions to meet ever changing market requirements. We endeavour to provide a machine that can withstand our client's harsh cleaning regimens. Our products are fitted with unique pressure compensation system that eliminates breather vents and keeps contaminants out. We provide optimal packaging equipment that work in synergy with the packaging materials. As a customer oriented organization, we provide start-up assistance to our clients. We also provide extensive engineering expertise for problem-free installment. Owing to our engineers' technical expertise the machines are optimized for high performance, such that, there is never discontent between the machinery supplier and the buyer over the performance specifications. The machinery has an average performance rate of 1500-2000 packages per hour. Our name is synonym to quality that we deliver in our every product. Also, we have adopted the latest manufacturing methods & try to accomplish all the given tasks on timely basis. For the assurance of quality sorted range of products we leave no space for error in our provided range of packaging machines. Additionally, we have separate quality testing base that give us the ease to check our entire product gamut at one time and that too in a hassle free manner. Our quality team checks the entire process in a streamlined way. We have sustained a great place in the market that is all the result of our hard work & consistent quality approach. We apply latest manufacturing methods in the processing of packaging machines. 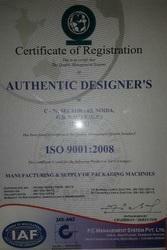 Also, we never compromise on the quality of products and work as per the latest market norms. Our timely delivery of products & timely execution of tasks have made us one of the premium brands of industry. Similarly, our experts know very well how to deal in this cut throat competitive market and deliver their best performance in the domain.